The first love in our lives is our mother. Recognizing her face, her voice, the meaning of her moods, and her facial expressions is crucial to survival. Dr. Christine Ann Lawson vividly describes how mothers who suffer from borderline personality disorder produce children who may flounder in life even as adults, futilely struggling to reach the safety of a parental harbor, unable to recognize that their borderline parent lacks a pier, or even a discernible shore. Four character profiles describe different symptom clusters that include the waif mother, the hermit mother, the queen mother, and the witch. Children of borderlines are at risk for developing this complex and devastating personality disorder themselves. Dr. Lawson's recommendations for prevention include empathic understanding of the borderline mother and early intervention with her children to ground them in reality and counteract the often dangerous effects of living with a "make-believe" mother. Christine Ann Lawson, PhD., L.C.S.W. specializes in clients who have experienced trauma either in childhood or adulthood. She is trained in EMDR, "Eye Movement Desensitization Reprocessing," Level II and incorporates the use of EMDR with traditional psychoanalytic talk therapy. She has previously served as adjunct faculty at Indiana University-Purdue University, Indianapolis, and Butler University. She is a graduate of Purdue University (1992) and her practice is located in Zionsville, Indiana. Unless you're a therapist or very familiar with psychiatric terminology, I don't recommend spending the money. Understanding the Borderline Mother by Christine Lawson was the first book I ever read that truly described my mother. It was a very emotionally hard read, but well worth it. It describes in detail four types of BPD mothers and the affect they have on their children. It describes the children of each and suggestions for how they can cope with their BPD mother as adults. And it describes the type of men who often marry each of the four BPD mother types. I am 14 years NC. I was treated for ptsd back then and had moved on with my life, but I never had that validation of having someone else describe her behavior. For me it was very healing. I found it much more helpful than SWOE because it is focused specifically on the parent/child relationship. There is a lot of great stuff in SWOE, but a parent/child relationship is not 50/50 and never will be, so some of it isn't really applicable in that situation. I also think it would be good for a Non parent who is trying to find out how the BPD parent is affecting their children. I think they might be surprised at how pervasive the damage can be. Another book that I haven't finished, but have had recommended several times is Surviving the Borderline Parent. It is kind of a self-help book that involves a lot of writing. I haven't had time to delve into it yet, but skimmed a few chapters and thought it looked very helpful, especially if you are just starting to work through the notion that your parent is BPD and/or are considering NC or LC. As a Non with a Borderline mother ex-SO. (We have a twenty-one month old son together) this book has really helped me understand how much damage is possible for her to do to our son. I can relate to the behaviours and type-casts and though the book is mainly aimed at adult children of BPD-mothers it does at the very least give 'Chosen' Nons a very good insight into what damage their (ex-)partners may be doing. It has helped me understand that my ex-SO who I saw as a very good mother is actually already exhibiting very unhealthy behaviour. Yes, it is expensive and you may be able to borrow it or read into it at a library, possibly a university library or something like that. Sometimes libraries will even order books if you ask them. I just got it from Amazon for $42.52 (new). I've read about half of it this week and I think it's great. I agree w/freesabird when she said it's the first book that really described my mother. The day when I first started reading it, my h thought I was getting too upset, he sugggested that maybe I should put it down and read something else for a while. I said NO. I felt like, all my life, I've searching, trying to figure out this puzzle... .so much of it I understood but couldn't explain even after educating myself about BPD in recent years. Much of what I was reading was finally fitting pieces together and validating my experience in ways that had not yet been. I wish I bought it years ago. I so liked this book (reading it because SS's mom is upbd) that I had one sent from Amazon to my friend. I recognized HIS mother in the waif. Unbelieveable. This was about five years ago and she was diagnosed two months ago with... .you guessed it... .borderline personality disorder. My friend says the book was painful for him to read, but that it was a great source of strength for him when he needed to set boundaries with his mother. Life changing book for me, too. Having continually struggled with the effects of my BPDexW on me, I was only beginning to understand the effects on our children... . I had my bright and perceptive 17 yo read the few pages on how waifs exaggerate the behaviors of their children to their spouses... .How many times did my ex call me at work and scream about "my son's" abuse, (how many times did she present self-inflicted bruises to our son's headmaster, blaming her own offspring), how many times did she have him arrested, how many times did she say to me, "If you were a real man, you would protect me from him... ." - And after my son read the excerpt, he said, ":)ad, I know mom is borderline - what's the point?" "The point, son, is that I want to apologize to you one more time for always believing your mother... ." Fortunately, he had forgiven me long ago. ACD, your post just gave me an "Aha" moment even though I read the book twice. It never occurred to me that "the waif exaggerates the behavior of their children to their spouses". Talk about denial, that sentence went right past me when I read the book. Now I understand why my BPD mother would greet my ETOHic father with a day's worth of complaints about my "laziness". As my father worked till 2am (bartender, let's not even get into his occupational choice), I would lay in bed and listen to my BPD mother recount what an awful housekeeper I was. On really bad nights, my parents would turn the light on in my bedroom so they could rant at me in the middle of the night. I was seven. I recently entered schematherapy where I finally am letting my "observant ego" see that poor child in her bed. Hence, the denial is shattered.But I get profoundly sad. It takes me a whole day and a half to recover from each therapy session. But it is the only way to move on with my life. This book is so very important for anyone to read who has children with a BPD wife. The impact on the children will be so dramatic unless you have a strategy and understand the situarion that you are in. I speak as a man who is happily married with a BPD wife , and children. My wife has done extensive therapy yet this book is so wonderfully written. Hi there:I have spoken with Christine many times, and she is very sharp and knows her stuff.Since there are so few studies about the effect of BP parents, what Christine did is collect all the studies about the TRAITS of BPD, such as the effect of anger on kids. If you care for children whose mom is BPD, you must read this book, and keep it to pass along to them. I have two SDs whose mom is BPD, and this book mentioned, with startling and disturbing accuracy, things they have told me she's done and said, and things I have witnessed. It helped me to understand and sympathize with their plight in the best way possible. As many others have stated, I too, find this book relevant. What I particularly enjoyed was the way the BPD traits and behaviors were grouped into characters (waif, hermit, queen, witch). The characters were given due attention. Contrary to real life where people openly rail against the queen/witch behavior without seeing clearly the insidious and sometimes even more damaging impact of waif/hermit - the book gave due time to the resulting damage of waif and hermit behaviors. I was left wanting more after reading this book. Lawson identified, albeit not so clearly, suplementary roles of the male non in understanding the marriage of these parents. I continue to seek clarity to the interplay between the Borderline mom and Non dad as I believe it is terribly important. I hope to see more written about the role and responsibility of the "non" parent. When I read this book, I already knew about pds - so the information in this book articulated and affirmed my experience, and displayed some of the different ways things can play out related to the trait groupings. However, I was left with a taste that there was more to the non-parent, and no place to go to satiate my need. It'd be a great book idea for any aspiring writers out there. I've put off reading this book for a long time. After reading it, I regret waiting so long. It's not very often that I find a psychology or self-help book to be a page-turner. I was only introduced to the term BPD about 2 years ago, by a therapist. I read this book three months ago, and it wasn't until I read this book that I was really able to grasp the effects that this disorder had on my childhood and the inner pain that I still suffer with today. It took a lot of effort but I finally “convinced” my husband to read this book. He read it in 2 days, and now he has a much better understanding of what I went through as a child, and what I’m going through as an adult. He now can better understand the term “emotional abuse”. I think the one thing that the author failed to adequetly express, is the complicated "mix" of characters, that make-up our BP mothers. At least in my opinion, my mother uses the whole bag of tools to manipulate and control, one minute she's a waif, the next she's a witch. This book has not only given me the words to express my feelings, but has also given me a much better understanding of who I am and why. For anyone who suspects that they may have a BPD parent, this book is a must read. This book will forever have a place on my bookshelf. 5 stars, thumbs up. I read the book and found it very helpful in understanding my family situation. Being the non-dad, it helped me see the role I had unfortunately played in the family. I would probably still be playing it if she had not moved out 4 years ago. Unfortunately, she has had our children (now 20 - son and 19 - daughter) with her all the time since then and they will not see me. Never the less, I bought two more books so I could give each of them one when it seems appropriate. Since they still live with her, now would not be a good time. I just read this book this past weekend. I found that I could read a few pages, and then I'd have to put it away for a while. After cooling down, I could return to it again for a while. It struck very close to home. My mother and my wife are both BPD. I could see my mother is many parts of the book and my wife in others. I'v promised to loan it to my sister, but I'm not sure she'll be able to get through it. My sister and I are the oldest children in the family and we were physically and psychologically abused regularly. The book also accurately described my Dad's behavior. I tried to intervene when my wife became upset with one of our children - my dad never did. It's a great book, very accurate. Even after years of therapy being a NonBP with a borderline mother, this book opened doors to my understanding of and dealing with what happened in my younger life. I had recently had dinner with a couple where the wife is a professor of Clinical Phsychology at a large University here in town. 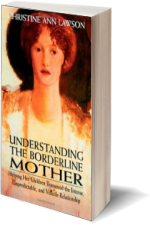 I lent her my copy of "Understanding the Borderline Mother", and after she returned it to me she stated it was the one unique book written on the subject - she had seen nothing else like it. She is now using it as required reading in her classroom. It seems that Lawson really hit it on the nail with this one. I just finished reading UTBM this week and I found it to be very informative and did a good job of explaining the characteristics of a borderline mother's behavior. I do agree with others here that many individuals are a combination of the types listed. I didn't have a borderline mother but my husband did (and he has BPD himself) and I know a few individuals who did. I almost didn't purchase the book because I didn't personally have a BP mother but I am glad I did. It helped me understand what my husband went through, not to mention some adult children and teenagers I know. I also thought she had some good ideas on dealing with BP mothers for those who choose to do so or who must do so. Other than reading sections in the bookstore, I have only just begun reading my copy (I used a bookstore gift certificate). Anyway, in my readings, I have gasped outloud numerous times at how accurate the descriptions are of my mother's disorder. The behaviors and in particular the effects on me as a child ring true to the point of being scary. I am looking forward to continuing reading the book and maybe gain some understanding as to my mother's sick behaviors and the effects they have had on me and my development. I struggled with my Mother and her effect on my whole life experience. I always thought I was a bad horrible person though out my entire life until my then therapist (5 years ago) handed me this book and said "I don't usually do this but I'm going to save you years a therapy please read this book." I read it and it changed my life! I sent it to a friend of mine seven years ago. His mother was dBPD, very much the waif/queen combination. She committed suicide a few months ago. My friend asked that instead of flowers, I send his two brothers and his father each a copy of this book. I did. I recently bought my own copy (the first time I read it, I checked it out of the library) and discovered a wonderful new way to use it---as a journal. Any time I read something that hits close to home, I underline it and write a description of my own story. It's really helped put things in perspective for me. I've read this book for a research paper I had to do for an Abnormal Psychology class. Unfortunately, I couldn't read all of it, but I read most of it. I'm going to read it again. I thought it was very informative and gave me alot of insight to my family and possibly why my sister has it. It also made me more afraid for my sister's kids. It's a great book for anyone who has a family member with BPD. You can apply the information to father's, too. This book absolutely changed my life dramatically, and helped my children put boundaries in place with their uBPmother. When my oldest was reading through it, she called out to me "I'm the bad child!" She also saw a lot of herself in it. When I started to read it, I had an a true epiphany. Everything that had been so crazy in my life finally had an explanation. It was my "Eureeka moment." I have recommended it to serveral people, including this morning to a woman whose daughter in law is dBP. I've read so many books on the subject and I feel this is the one book to read if you are going to stop at just one. This book is an amazing resource... .I found it tremendously helpful in helping me understand the BPD relationships in my family. This book has become like something of a personal Bible for me. It's given me validation that I really am NOT the crazy one and al the way through it I had "OMG That's my life!" moments. About things that I would never have thought related to the way Mum treated me (as the evil daughter) and things I had never even talked about with anyone else! It was like she was inside my head. It was truly an incredible, validating, wonderful experience. Anyone who has a BPD mother absolutely needs to read this book. It's a sanity saver and will help you establish the boundaries necessary to live your life. This book was like finding the missing puzzle piece for me. I am a secondary non. I believe my BF's ex is uBPD. I had not even heard of BPD a few months ago, but saw it mentioned on a website with some personality traits I had seen in his ex. My BF had said "things are always black and white with her", that she had blamed their oldest son for all her problems and I heard all the time about her fears. I knew she suffered from anxiety and depression, but so many of her actions seemed beyond what a normal Mom would do. My BF read sections of Lawson's book, although I know it was painful for him. He saw himself in the Huntsman description. It has helped us both understand some of what she does and explain what otherwise seemed completely illogical. No book has ever brought me more comfort. I still pull it off the bookshelf every few months if I feel stressed or if I start to think that I'm just being whiny or crazy. I find that because Lawson's descriptions of borderline mothers are so specific, they validate my own experience. I'm constantly doubting whether I'm making this whole thing about my mother up, so it comforts me to read something that is so uncannily accurate. When I hear more general descriptions of borderlines, I start to think "oh well, my mother never tried to kill herself, so I must be making everything up" but with Lawson's book, there's just no denying that my mother is a Hermit uBPD. The fact that she doesn't fit the Queen or Waif types doesn't mean she's not borderline, it just means she's a different TYPE of borderline. The things she mentions are just too specific, too dead-on to deny. It makes me feel like I'm not the crazy one. I bought this book last August, read it and refer to what I learned from it when dealing with my own "mommy dearest" BPD mother in my depression therapy. My mother's physical body died in late September, 1990. The internalized her, which I constantly carry about, I deal with on a daily basis. Dr. Lawson's book is a technically oriented text. It is not written for someone just off the street. It helps to have Webster's Collegiate Dictionary nearby whenever venturing into any new topic. I am a Physicist by education and spent the last 30 years designing optical systems in the aerospace business. I had some psychological terms to become familiar with. This was taken care of with a few general beginning type texts at the local book store and a few clarifying questions to my psychologist. In order to get the most from this or any other book, one must be willing to become familiar with specialized, topic specific terms. When I, the patient, picked up Dr. Lawson's text, I took on personal responsibility and became my therapist's assistant. Anyone with a BPD mother, in my opinion, can't afford to ignore the associated problems. A BPD mother, alive or dead and internalized, can cause a lifetime of sadness, confusion and misery. To become free from this type of mother, the price in learning a few new specialized psychological terms seems a small price to pay. Dr. Lawson's was the first BPD book I read but it won't be my last BPD book I read. I am happy to have read the book and will keep it as a reference. It helped me understand the dynamics of my life up until I'm become NC 4 years ago with my Hermit uBPDm. My father is a textbook Huntman so it was great to finally understand what was wrong underneath all that perfect image veneer. There's one sentence that I really didn't like about the book "It's only a matter of time before the bordeline's no good daughter becomes a bordeline mother herself " (Chapter 7, page 168). As the "no good daughter" of my uBPDm and father, I did not develop BPD and I do not like the sense of doom implied in the above sentence. When I went NC, I did see a T but I helped just a bit. What really helped me was being finally free of my uBPDm influence and going to support groups. The book seems to imply that if you do not enter a lengthy therapy you will not get better and that's not true. Because I was raised by a uBPDm, I had learned a lot of unhealthy behaviors that I have unlearned after learning new, healthy behaviors. Like I said, I saw one T for a few months, then I saw another one for a few sessions, just enough to understand my behaviors and learn new ones. Going to support groups helped me a lot as well. I'm only explaining all of this because not everyone has the means or the time (or both) to enter a lenghty therapy and I feel having been "the no good child" is already bad enough without feeling doomed after reading a book supposed to help you. I was just wondering about Ms. Lawson. Is she a practiving therapist? It seems like she wrote this revolutionary book for those of us in this situation and then disappeared. Just curious if any of you knew anything about her or, better yet, when she's releasing another book!